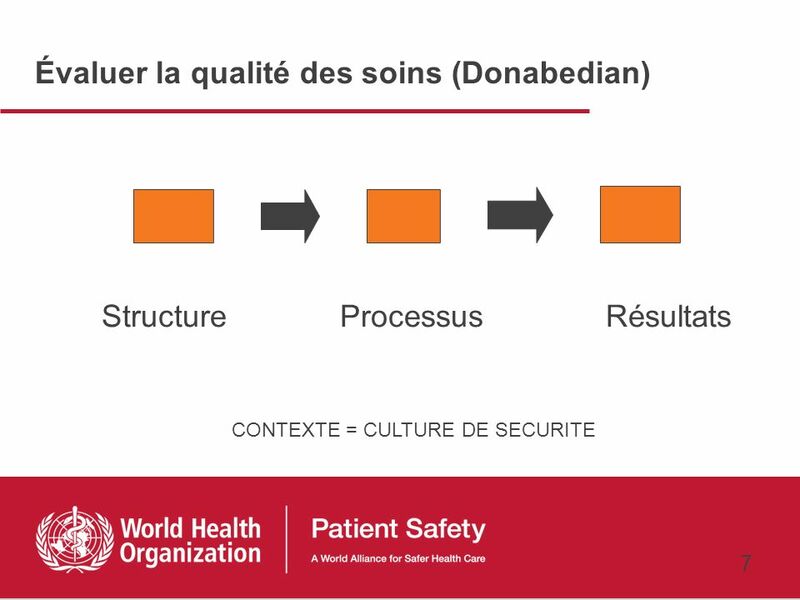 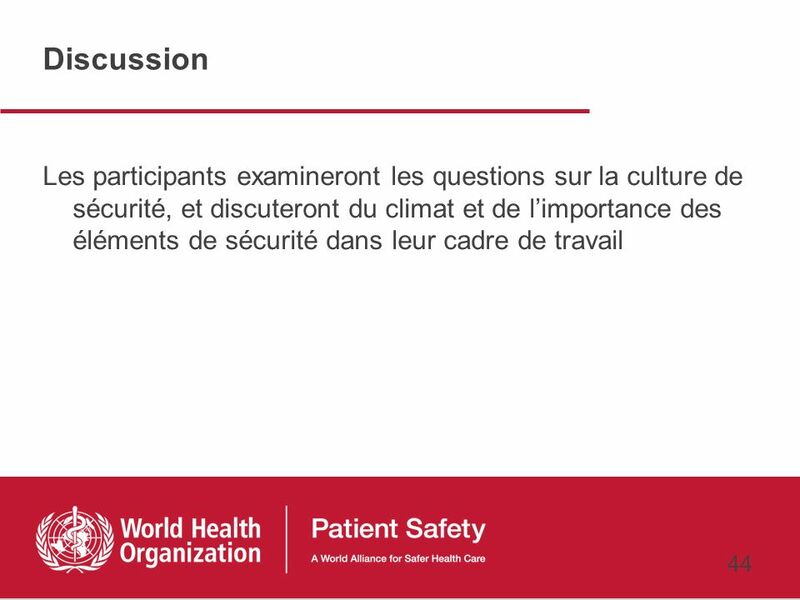 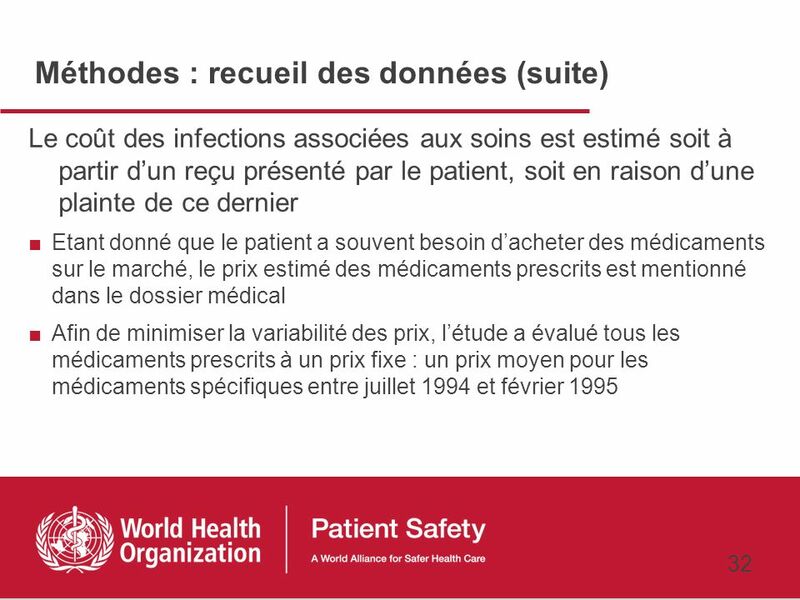 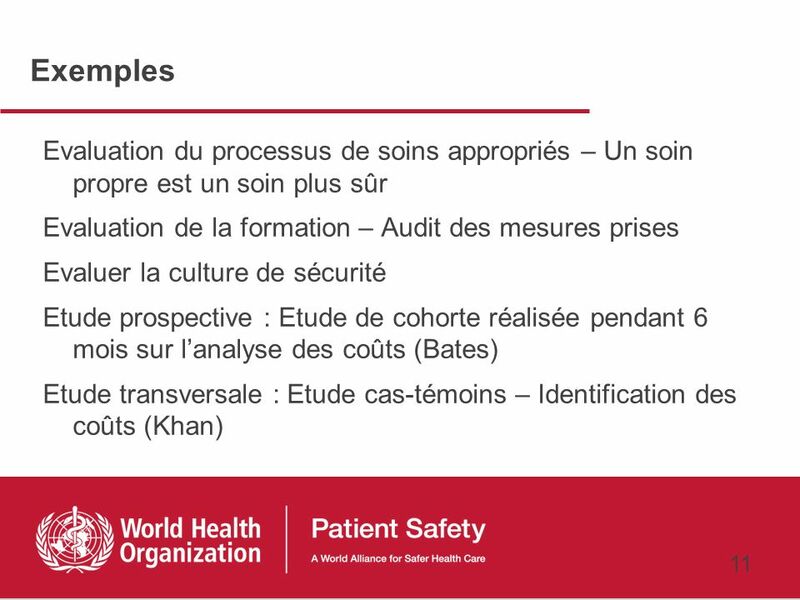 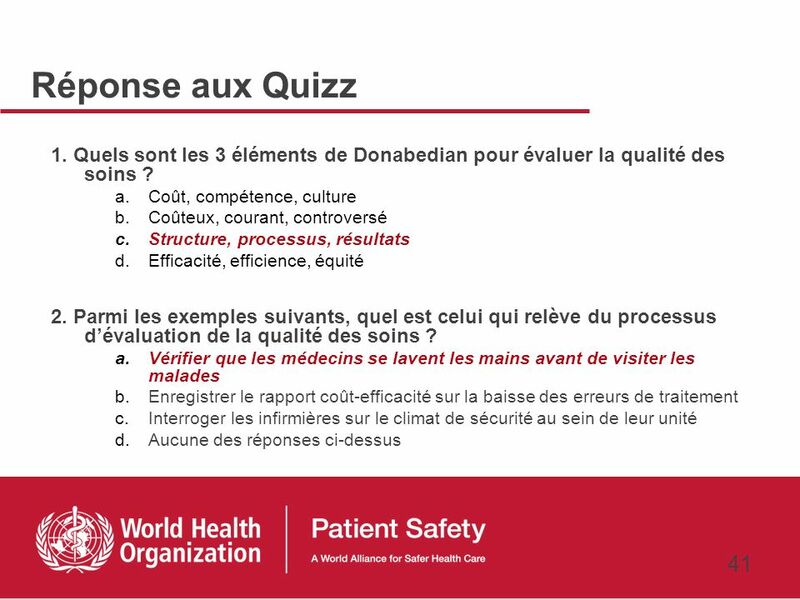 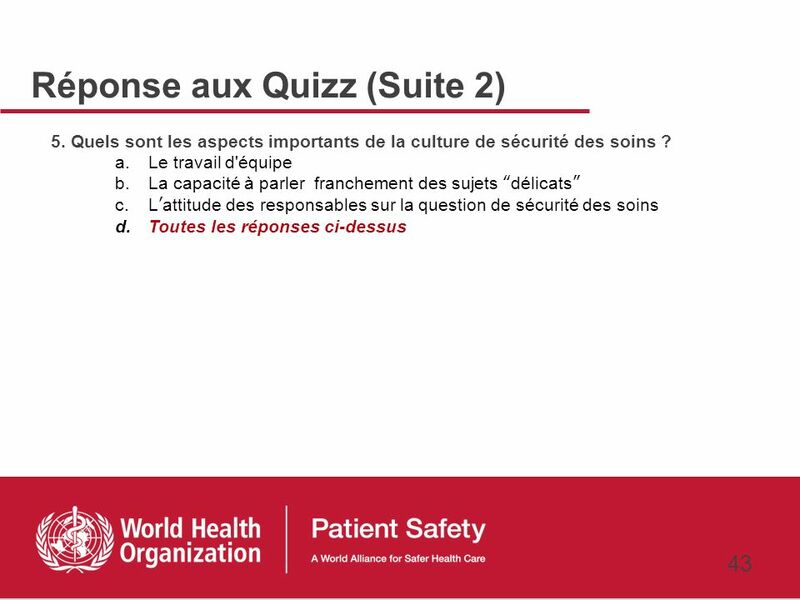 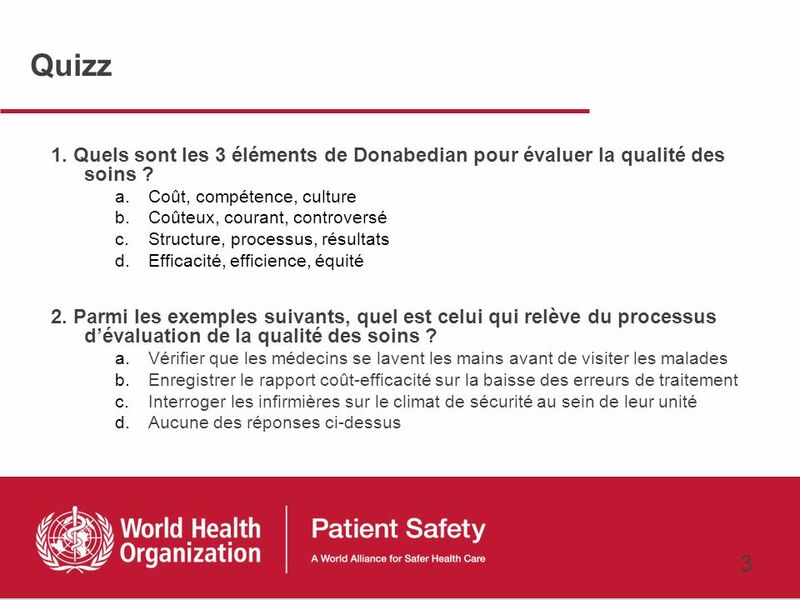 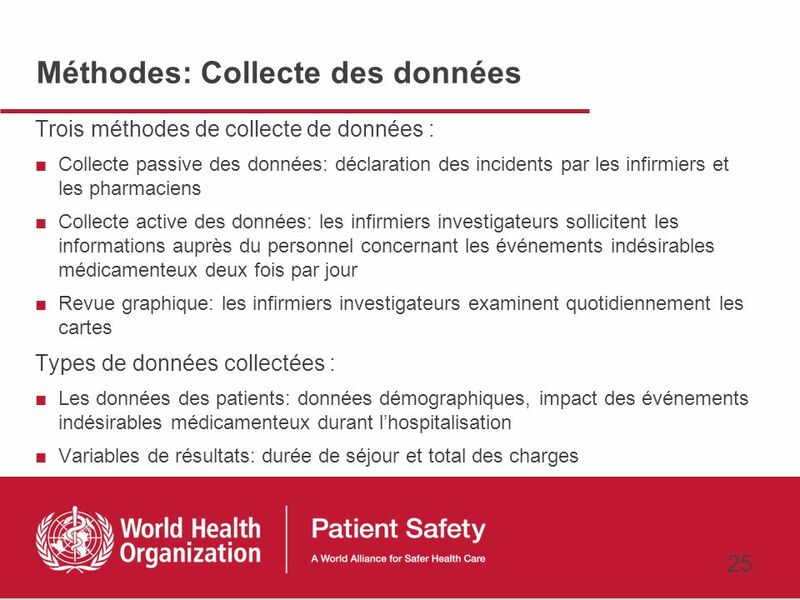 6 Introduction Comment évaluer la sécurité des soins ? 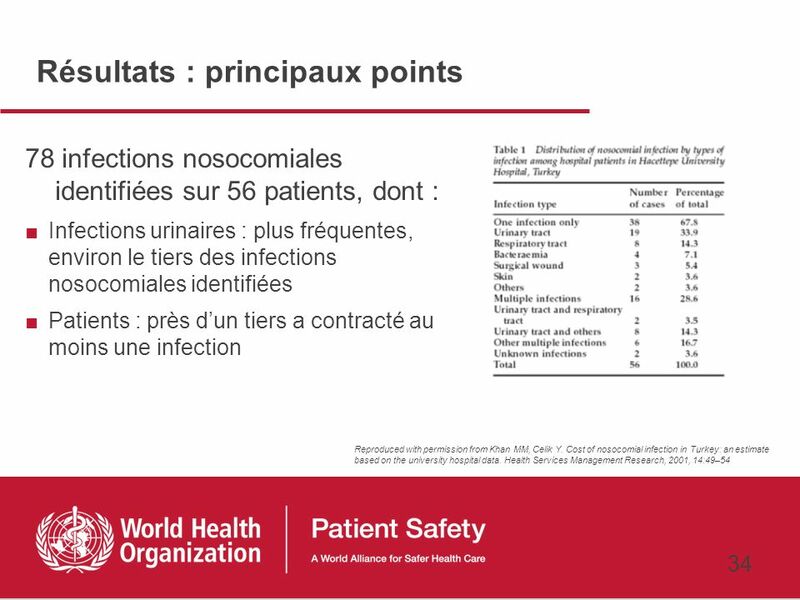 Premier défi mondial pour la sécurité des patients Un soin propre est un soin plus sûr Recommandations de l’OMS pour l’hygiène des mains au cours des soins Millions of people are affected by health care-associated infections every year, causing serious health complications, longer hospital stays and an increased risk of death. 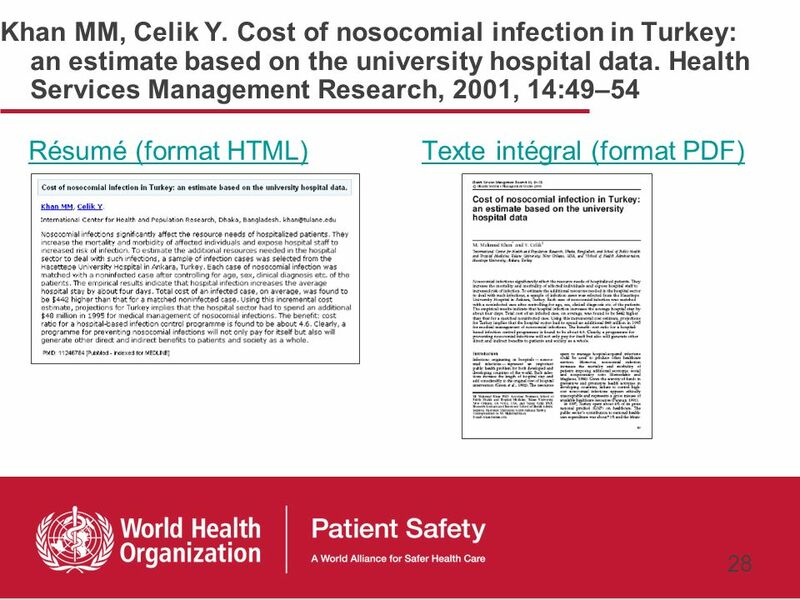 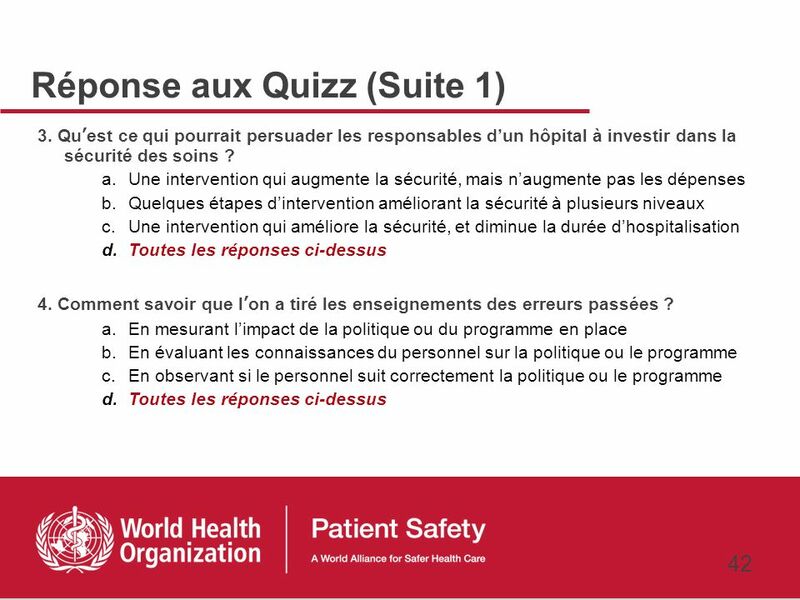 The first Challenge was launched in 2005 to stimulate health-care workers world-wide to practice good hand hygiene at the point of care as a first step to ensuring high standards of infection control and patient safety. 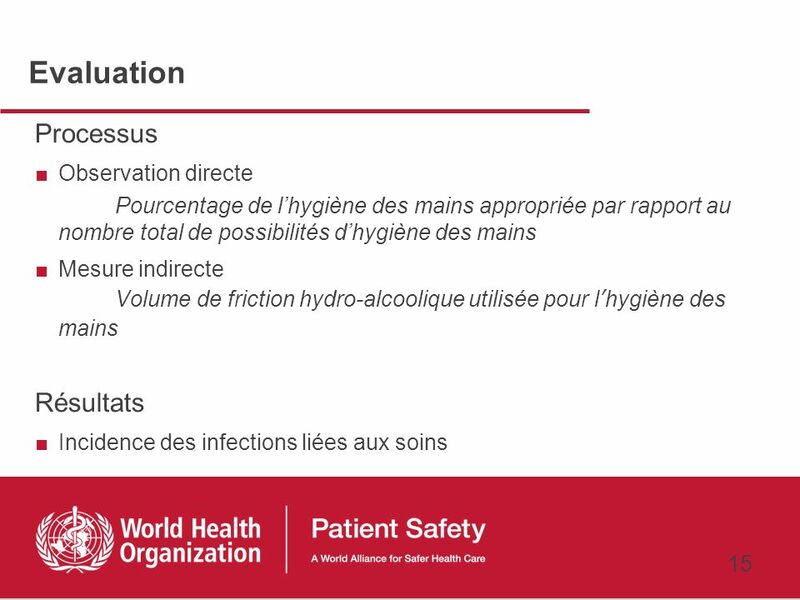 The basis of hand hygiene as outlined in WHO guidelines and the suite of tools that were developed, was the use of alcohol-based handrub or soap and water when attending a patient. 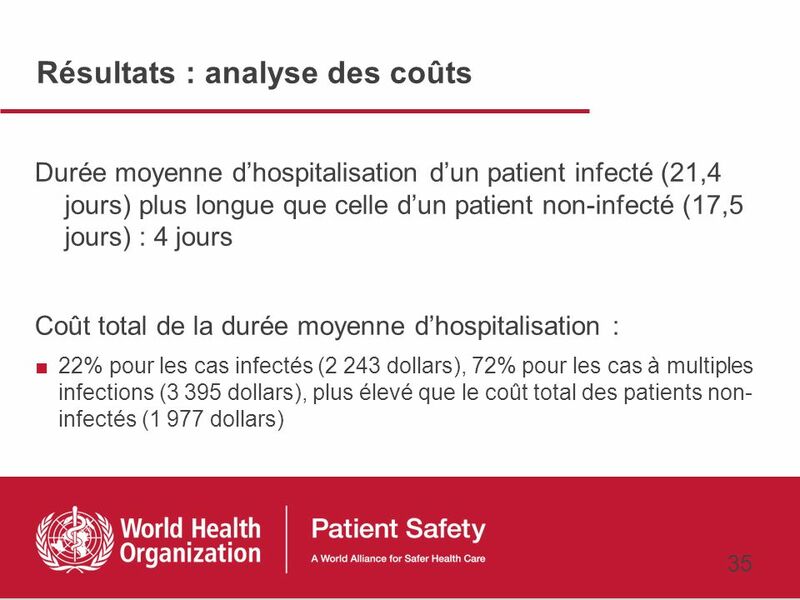 The Challenge invited Ministries of Health to pledge support for this work and to initiate programmes in their own countries. 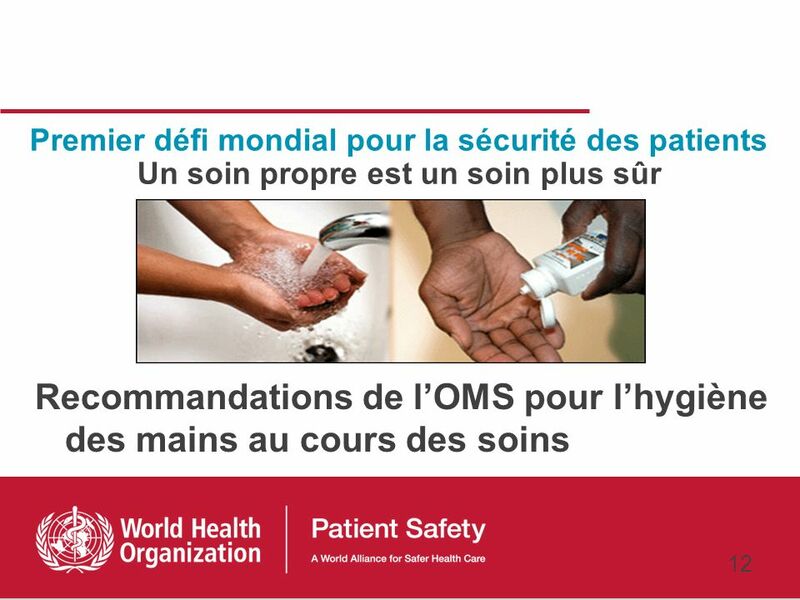 By May 2009, 120 WHO member states had signed the pledge and more than 30 countries had established hand hygiene campaigns. 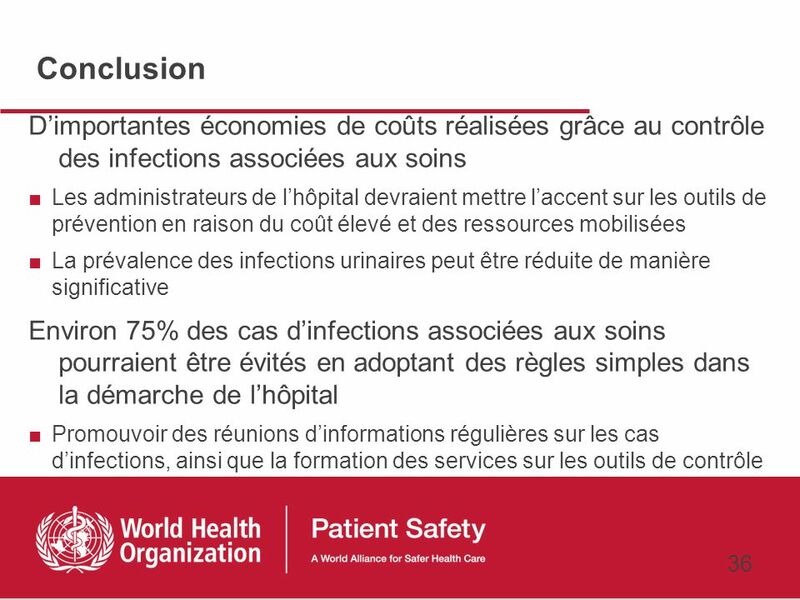 Led by Professor Didier Pittet, a recognized global authority on infection control, the Challenge team has developed a mechanism for reducing health care-associated infections using hand hygiene at the point of care as its critical success factor. 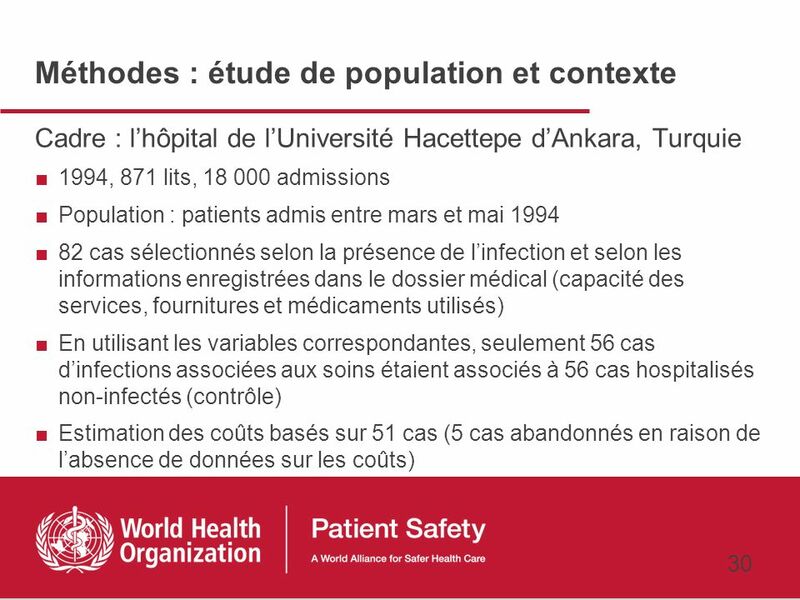 Through pilot site testing, innumerable scientific papers and documented evidence, together with collaboration between a core group of international experts, hand hygiene has become one of the most important aspects of patient safety. 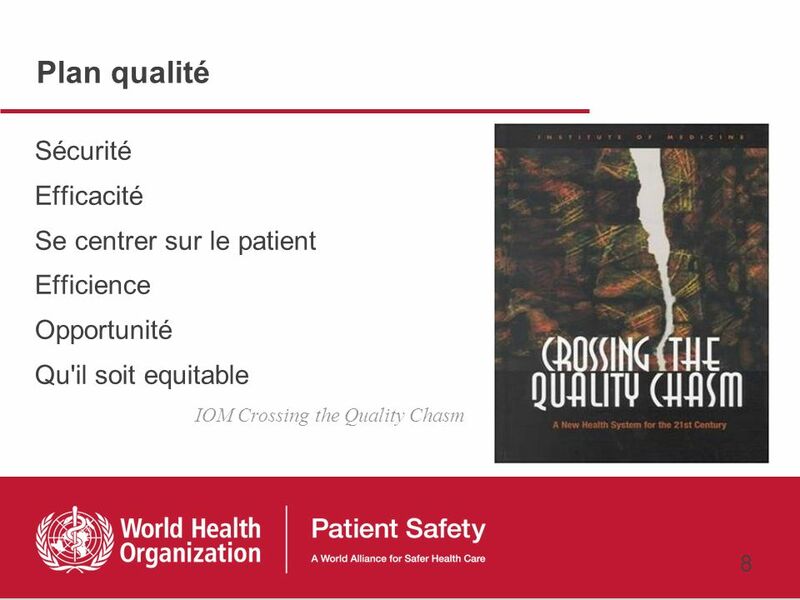 At its heart, the Challenge aims to: Ensure health-care workers have clean, safe hands at all times Promote access to alcohol-based handrub or soap and water for health-care workers regardless of their location Provide online access to the tools and materials required to educate, inform and support compliance in health-care settings Work with international and regional experts to ensure ongoing, targeted action and support for infection control measures. 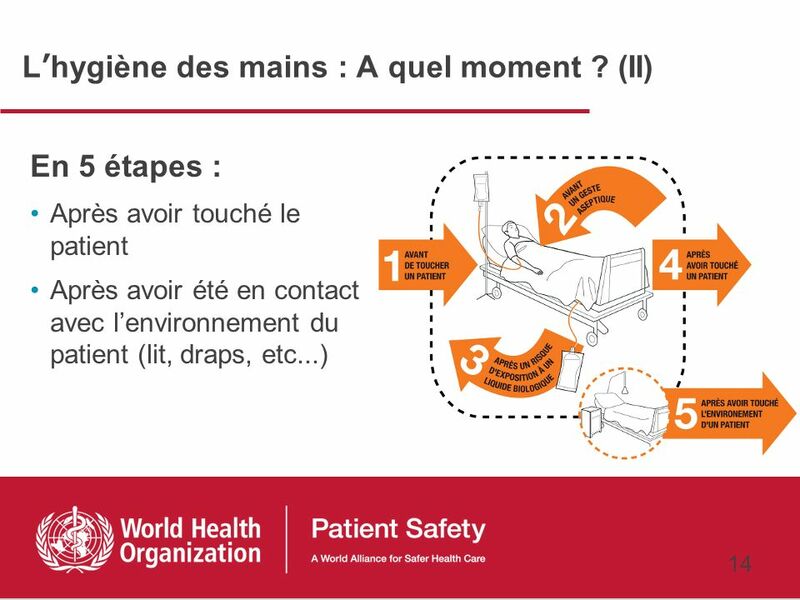 In May 2009, a new phase in the Challenge programme - SAVE LIVES: Clean Your Hands - was launched inviting hospitals and health-care facilities throughout the world to register their support, and to better focus attention on the point of care message. 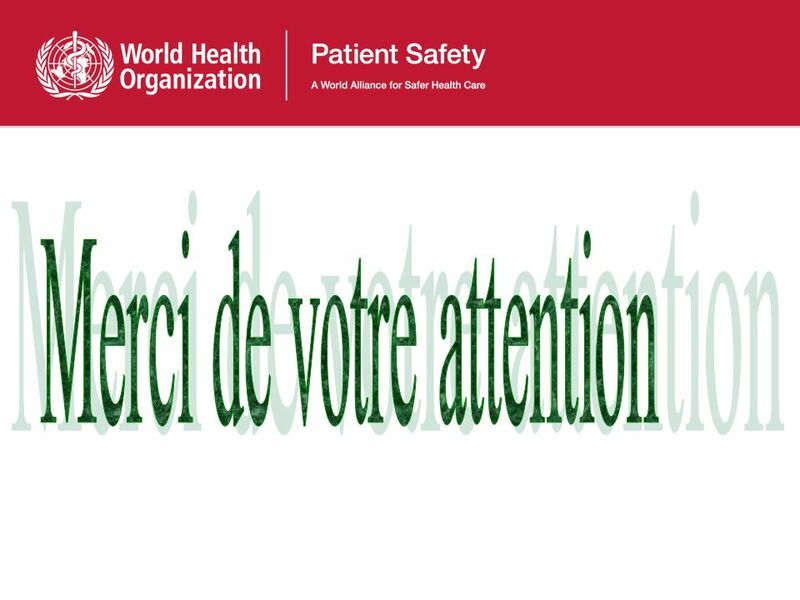 By the end of May more than 5000 registrations had been received from 120 countries. 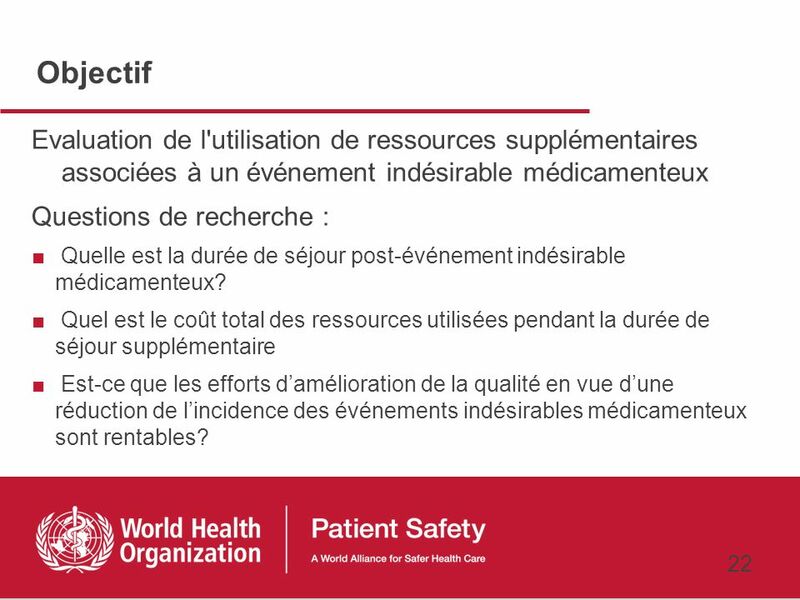 22 Objectif Evaluation de l'utilisation de ressources supplémentaires associées à un événement indésirable médicamenteux Questions de recherche : Quelle est la durée de séjour post-événement indésirable médicamenteux? 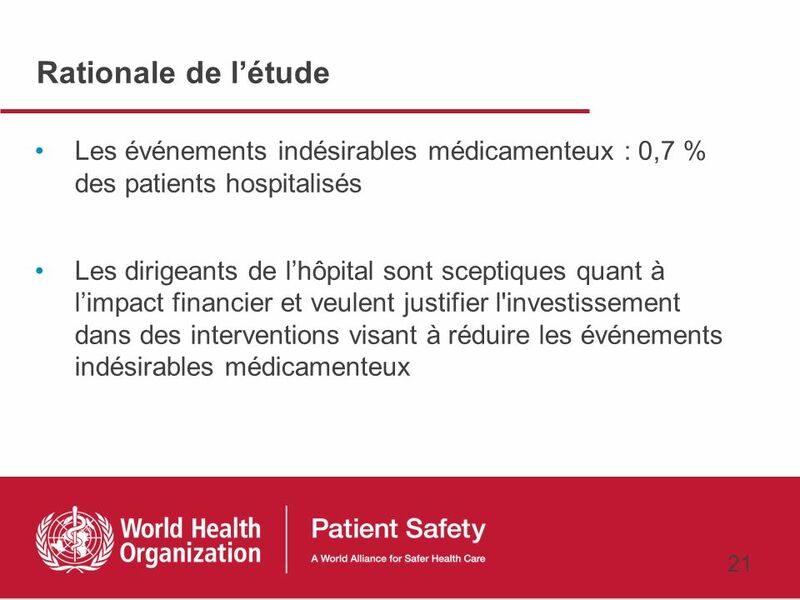 Quel est le coût total des ressources utilisées pendant la durée de séjour supplémentaire Est-ce que les efforts d’amélioration de la qualité en vue d’une réduction de l’incidence des événements indésirables médicamenteux sont rentables? 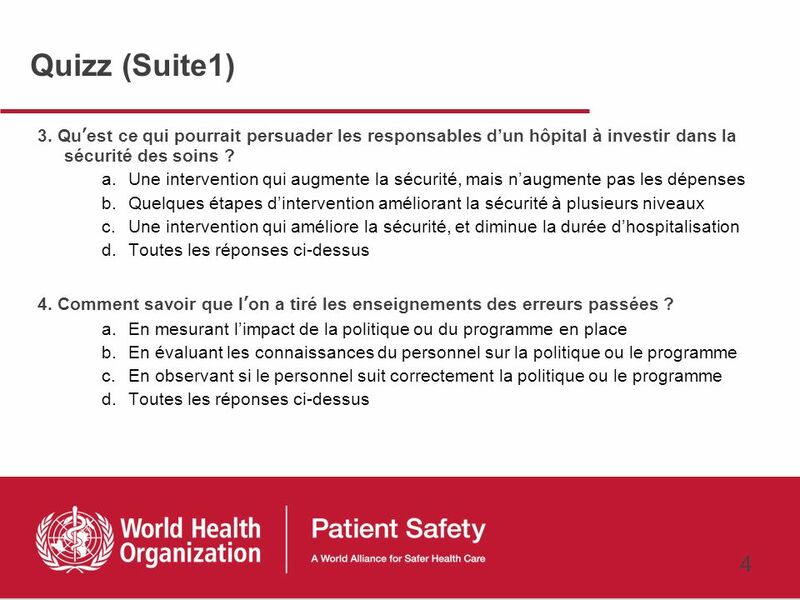 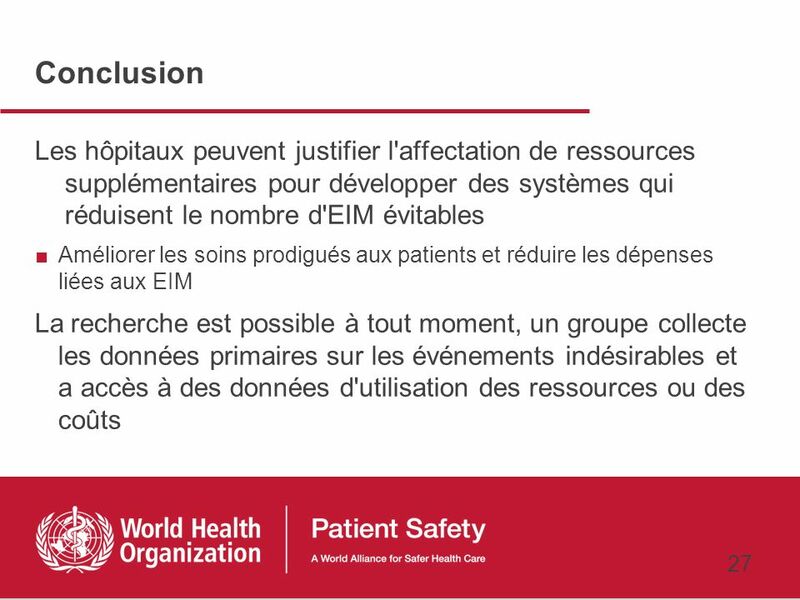 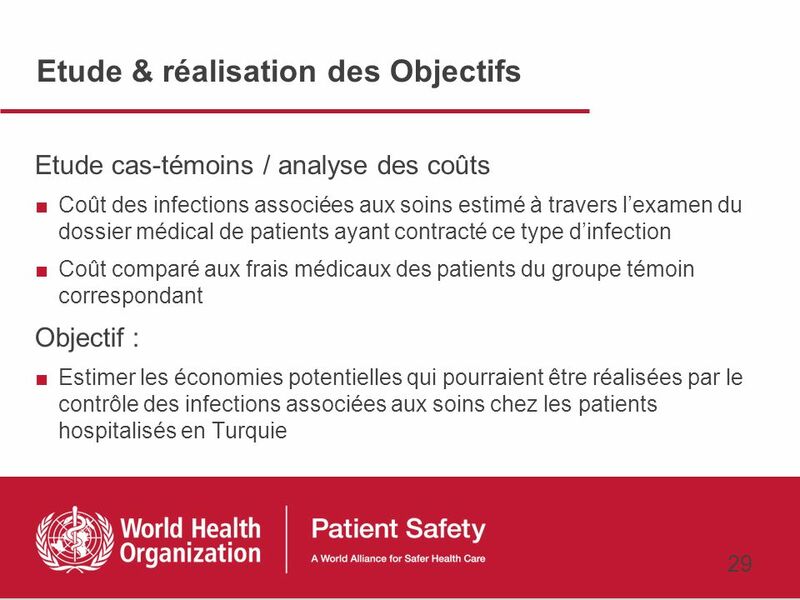 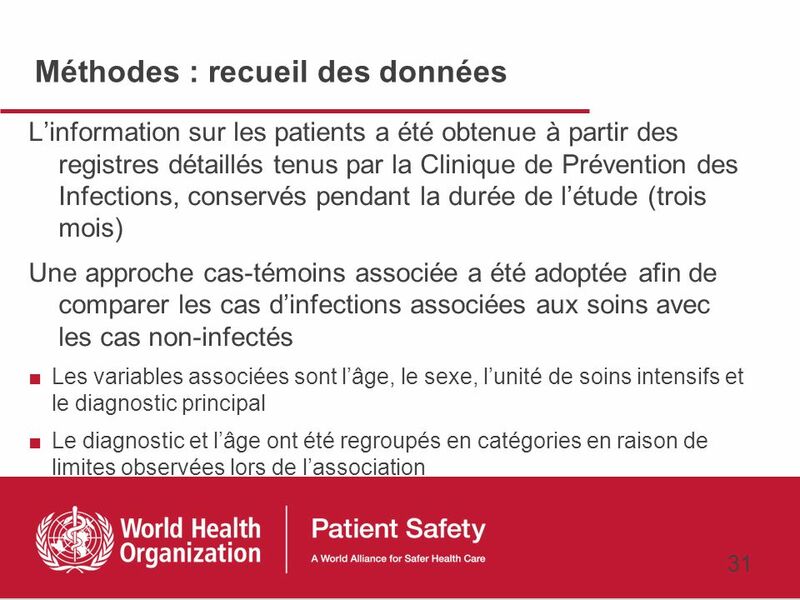 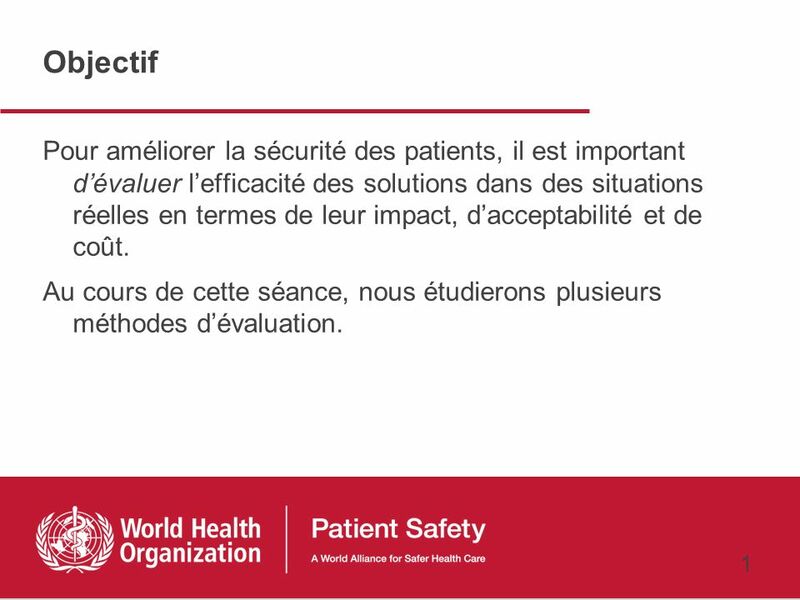 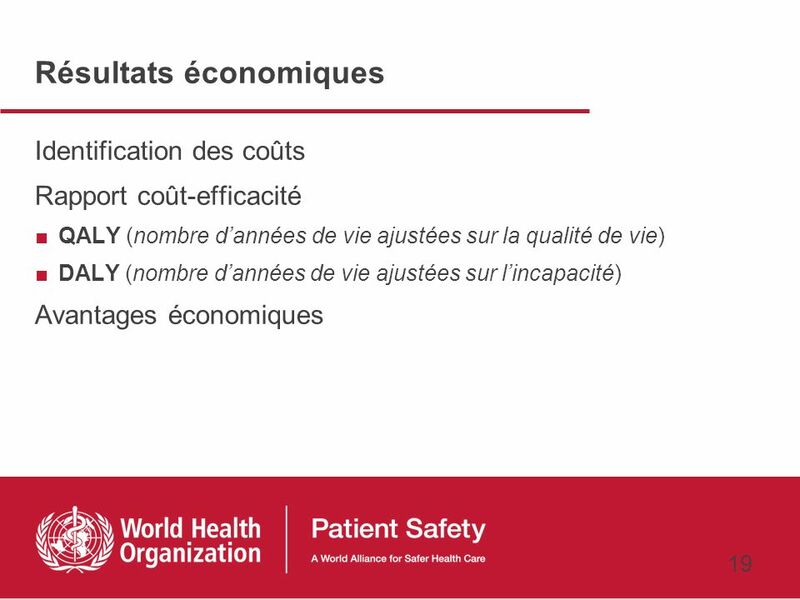 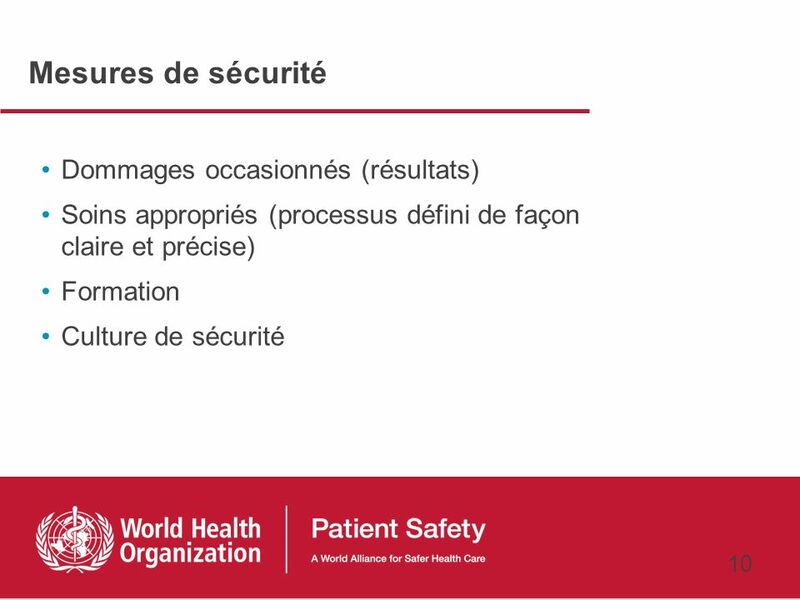 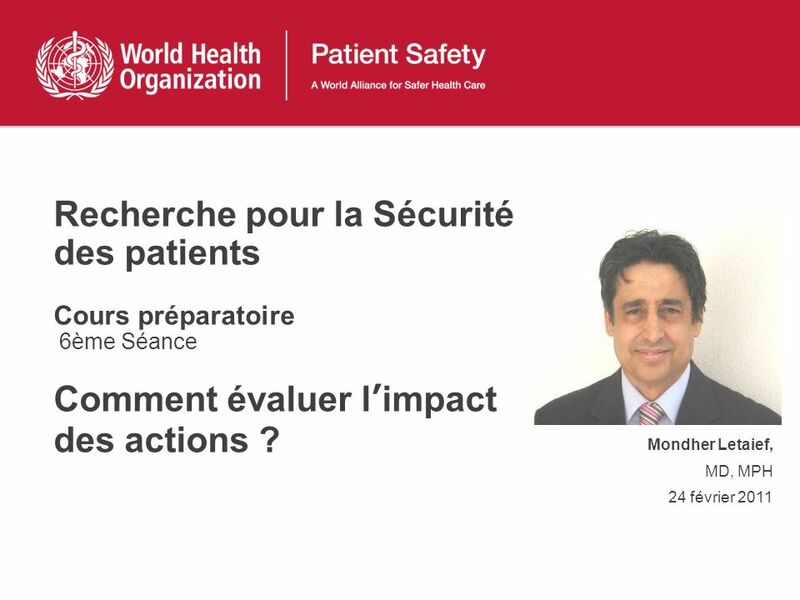 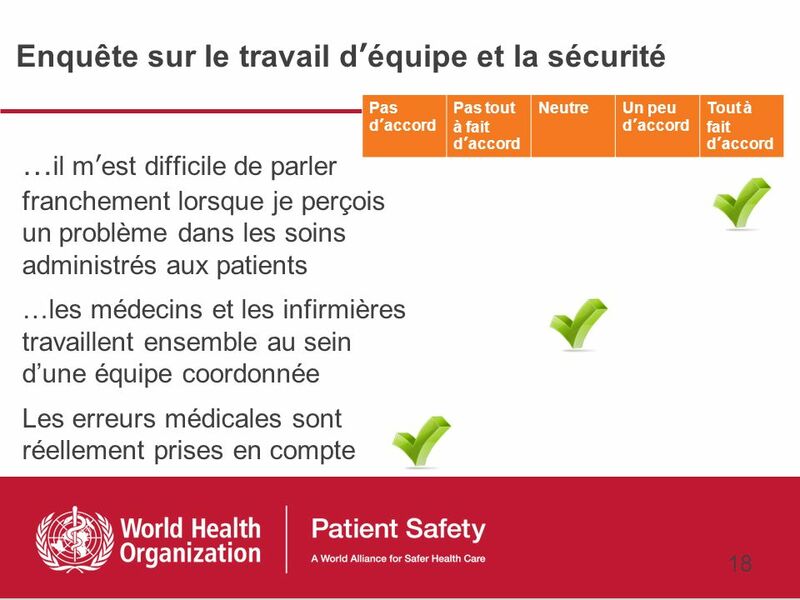 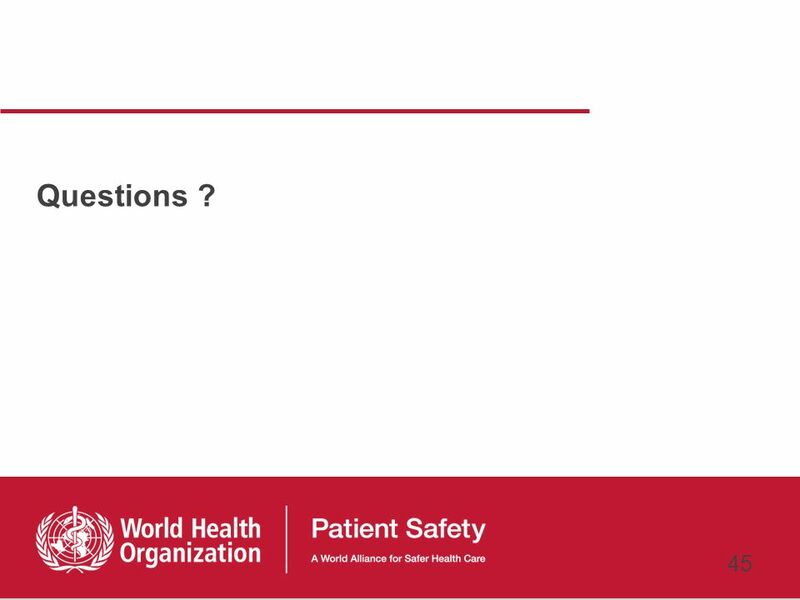 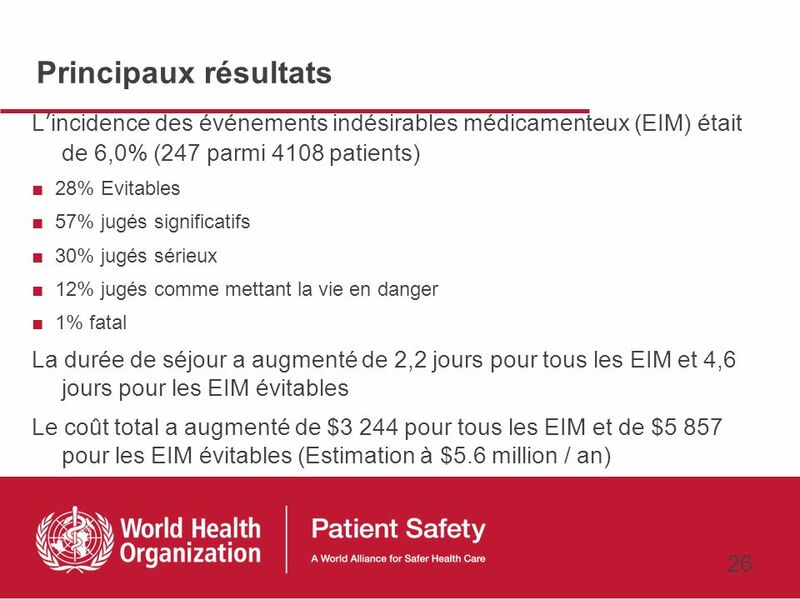 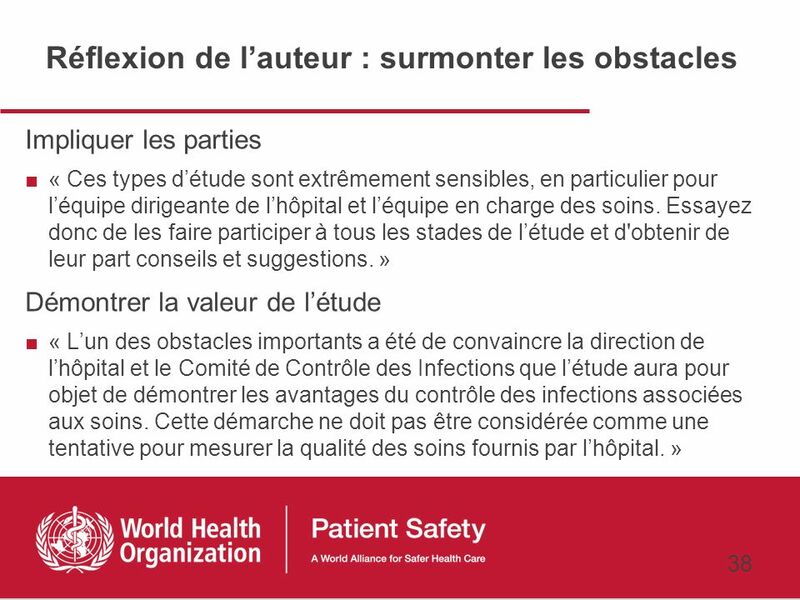 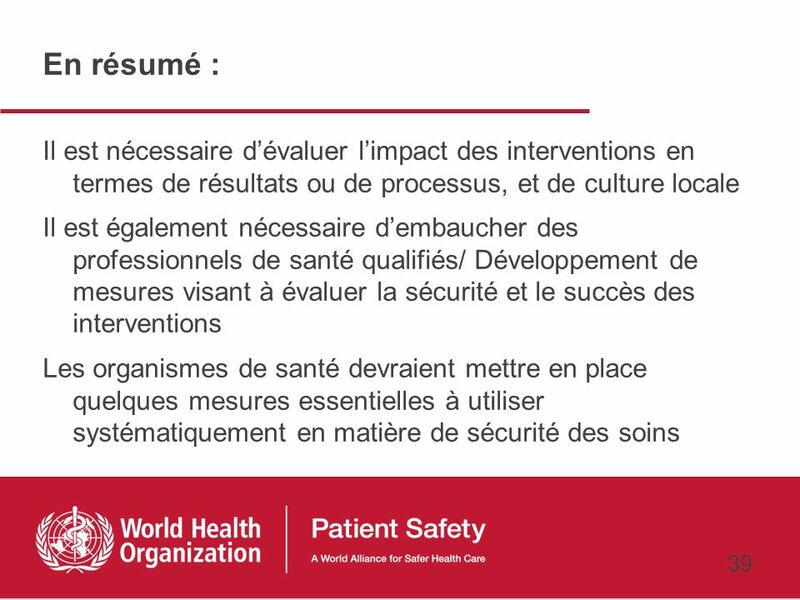 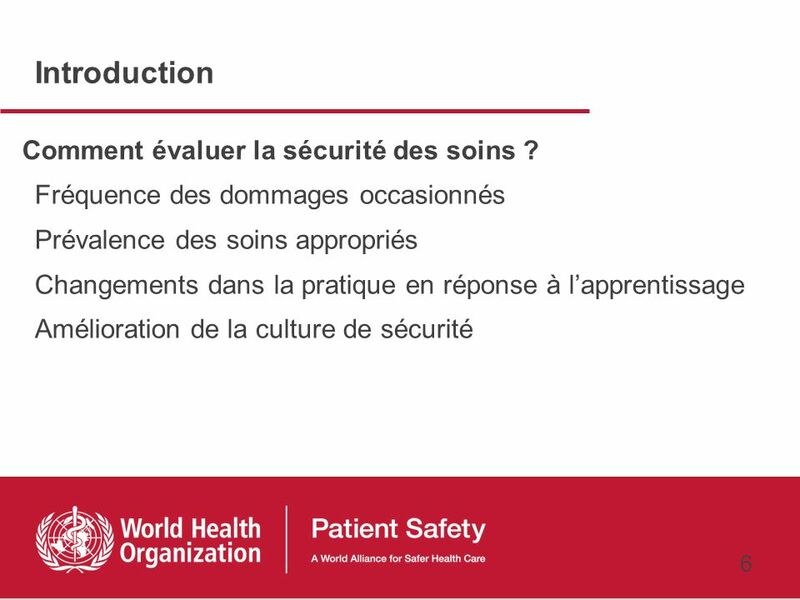 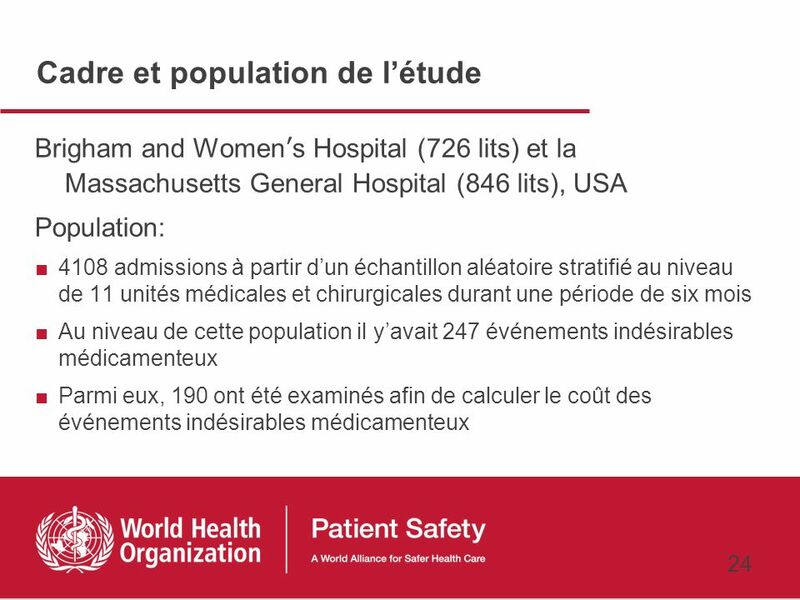 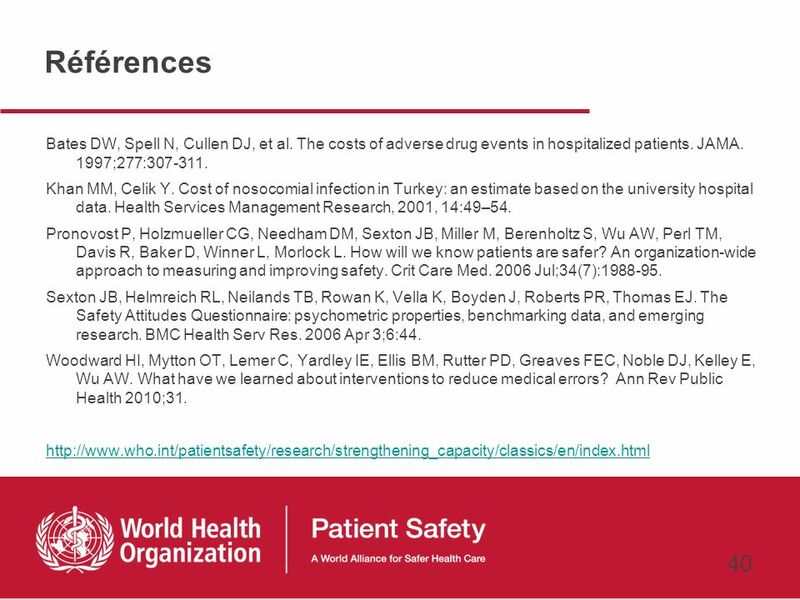 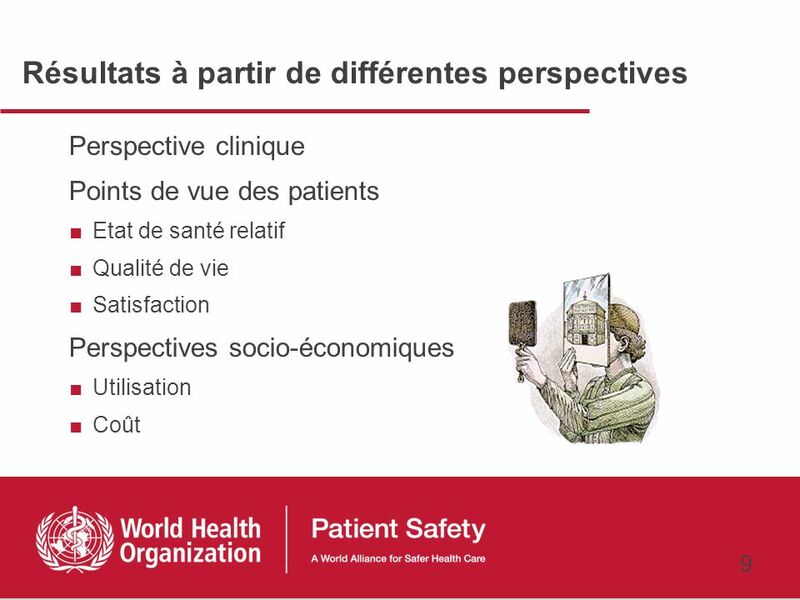 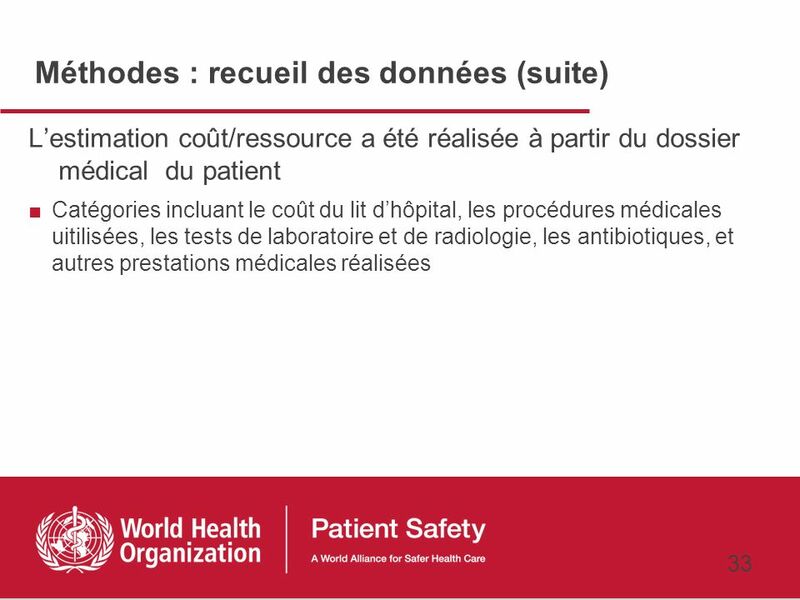 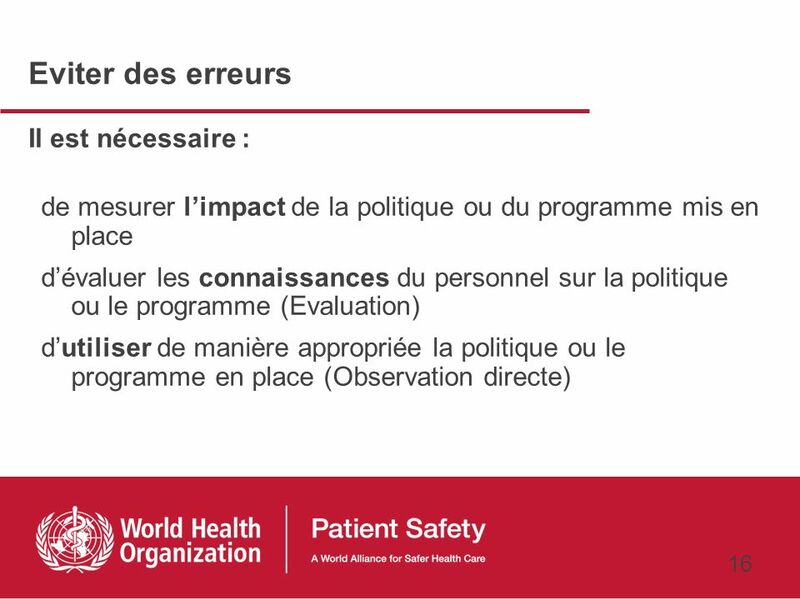 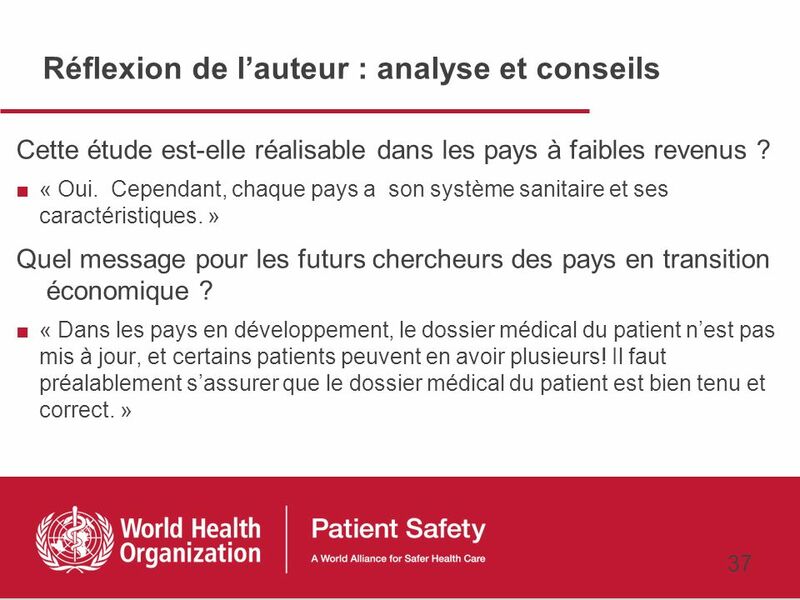 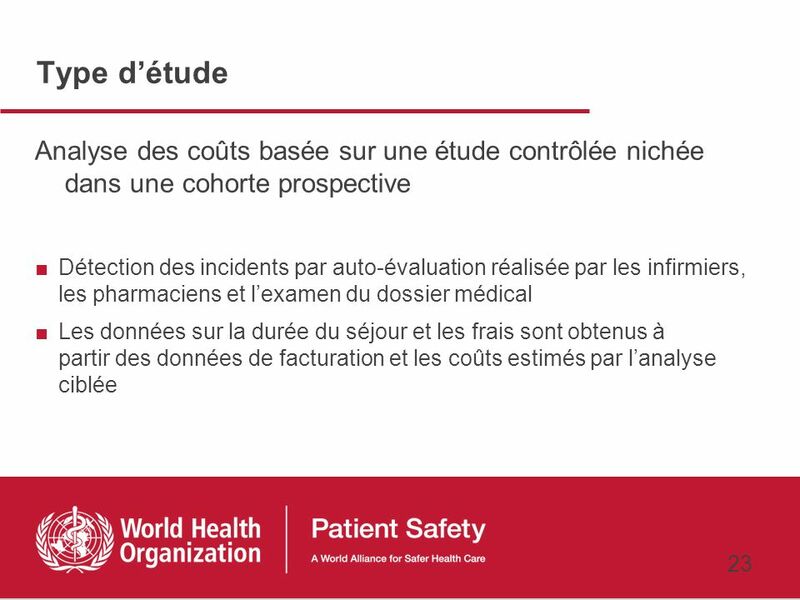 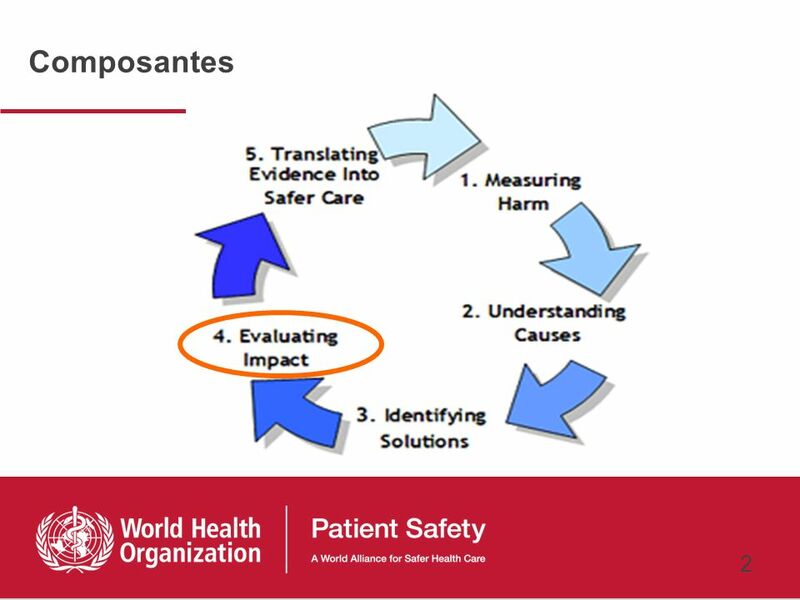 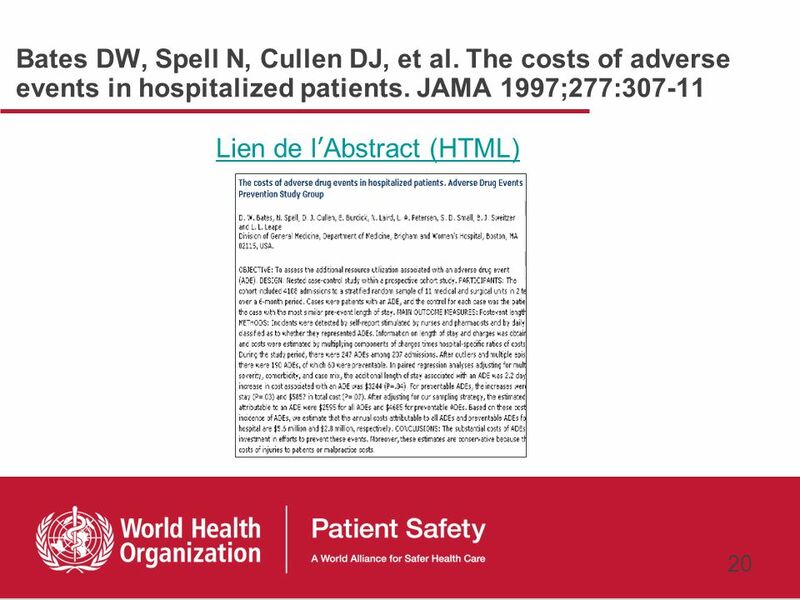 Télécharger ppt "Objectif Pour améliorer la sécurité des patients, il est important d’évaluer l’efficacité des solutions dans des situations réelles en termes de leur impact,"